Have you ever tried to copy and paste a range with hidden rows or columns and didn’t get the results you expected? This problem can be frustrating and time consuming! In this post and video I will explain how to solve this problem with a very simple shortcut to select the visible cells only. Have you ever tried to copy and paste a range with hidden rows or columns and didn't get the results you expected? This problem can be frustrating and time consuming! In this post and video I will explain how to solve this problem with a very simple shortcut. The shortcut will select the visible cells only in a range, ignoring the hidden rows and columns. Why Are My Hidden Rows & Columns Being Pasted? 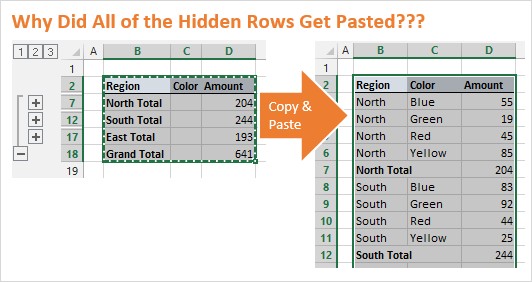 When you copy a range of cells that contains hidden rows or columns, Excel includes ALL of the selected rows. It does not matter if they are visible or hidden. When you go to paste the range, all the cells in the selection will be pasted. This is actually a nice feature, but it's not always what we are expecting to happen. Sometimes we only want to copy and paste the visible cells, and exclude the hidden rows & columns. This commonly happens when you are working with a range that has filters applied to it. Or when you have hidden rows or columns from a collapsed group in an outline. The Subtotals feature automatically creates row groupings that can cause rows to be hidden, as shown in the example above. Excel gives us an option to select the visible cells only using the keyboard shortcut Alt+; (hold down the Alt key, then press the semi-colon key). The Mac shortcut is Cmd+Shift+Z. This shortcut will exclude all the hidden rows and columns from the selection. Select the entire range you want to copy. Press Alt+; to select the visible cells only. 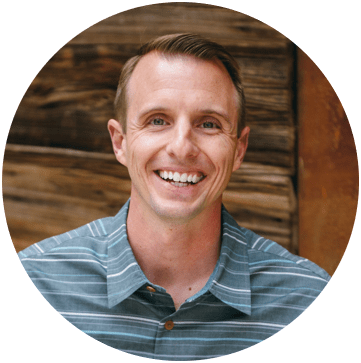 You will notice that the selection is cut up to skip the hidden rows and columns. If you don't use this shortcut often then it might be hard to remember the keyboard shortcut. Here are a few alternatives for selecting visible cells. 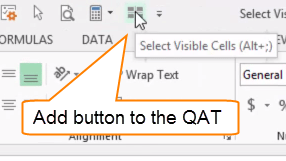 Please see the video for step-by-step instructions on how to add this button to the QAT. Pressing the button will select visible cells only. It also shows the keyboard shortcut when you hover your mouse over the button. You can also find the Select Visible Cells Only option on the Go To Special menu. This can be a very useful menu for selecting other types of cells besides just visible cells. As you can see in the image above there are a lot of options for different types of cells you can select. There are a few different ways to open the Go To Special menu. 2. Press Ctrl+G or the F5 key on the keyboard from anywhere in a worksheet. Then press the Special button. Either way, this is one shortcut that should help save you a lot of time! If you have ever received the following error message in Excel, “The command cannot be used on multiple selections”, then you know that you cannot paste to the visible cells in range that contains hidden rows or columns. This is a limitation of Excel, and it can be frustrating. The video below explains two workarounds for this. Click the following link to learn more about the Paste Visible feature and download a free trial of the Paste Buddy add-in. Mandy asked a great question in the comments below about how to paste the visible cells to an email in Outlook. The following screencast animation shows how to do this. The Paste button on the Message tab of the Ribbon contains a small drop-down arrow underneath it. Click this arrow to see the Paste Options. You can hover over each of the options to get a preview of what the paste will look like in the email. When copying and pasting from Excel to Outlook, I usually use either the “Picture” or “Keep Text Only” options. If I know the user will be copying the data out of Outlook, then it's best to give them the text. If I know the user will only be looking at the data, then I will paste a picture because I know the formatting will remain in tact. How do I copy and past filter cells into another column which is filtered also? Just what I needed. ! Quick question, when pasting visible cells only into a new excel sheet, I select “keep source column width” and only the columns appear but no data. Any other selection in paste shows data, but changes all the column widths. Any suggestions? do you have als a VBA code for that ? Can select visible cells only be used with chart tools when creating a chart based on multiple worksheets? Great and to the point! Thank you so much! Exactly what I wanted. Thank you for your perfect explanation. This video is useless. The question is how to PASTE in filtered cells. All you showed is how to copy from filtered cells! Read the question carefully first. Please see the section in the article “Paste to the Visible Cells Only”. There is a video there and I believe it answers your question. Pasting to a filtered range is not directly possible in Excel. However, I show two workarounds to that issue. I hope that helps. How to copy paste hidden cells on hidden cells (only values) -i´m looking for quick way to add running numbers to a table that includes hidden cells and I want to paste the runnig numbers to specific rows (when there are hidden cells). I would like to sign up for your offer. I have a question though. It pastes a lot fewer values in my pasted column than there are in my column where I selected and copied the visible values only. Why? I’m not sure I understand your question. It might be easier to see an example. Are you pasting to a range or sheet that does NOT have hidden or filtered rows? If so, then it might be that all the rows in your filtered range were not selected before selecting visible and copying. I hope that helps. Great tip- thank you. I’d like to subscribe to your offer.